Lots of changes in the last month, well since the May 20th eclipse and the May 14th activation day. Those days were upgrade days for me and the effects of that increased energy have left me feeling expanded, more certain about my current LBP, have also cleared the air in some other respects. I just want to give a quick update because I haven´t written anything for a while. WUB is going through a dormant period as I get rid of things that are no longer working for me and which are proving to be energy leaks. That includes one certain relationship that was not working but draining me of life force and a sense of joy. I assume what brought us together in the first place was unresolved karma, but mostly what I am taking from the whole experience is that it forced me to let go of a program in my subconscious relating to “saving other people” and “martyrdom”. I have come to yet another step in the spiral that is spiritual evolution: I realize that people need to take own steps and make their changes and leaps at their own pace. I am in no position to try to help others with their learning spirals right now. Not only because my soul is asking me to reserve all of my energy to work on my own stuff, but because it is not my responsibility to fix other people. My job here is to ground energy in my own body and allow the changes to take place that result from that grounding. I am now going through a “spring cleaning” fever. I have come down with the ascension flu again, just like the very first Gemini/ Saggitarius eclipse last June, so I know this is a cycle ending. I feel my immune system is really ramped up. Lots of changes with my pineal gland as my sinuses drain and I experience massive headaches, zapping noises in my head and strange light codes. There are changes with the thymus gland as I acknowledge a sore throat, night-time cough, shoulder and neck pain and swollen lymphnodes. The higher chakra centers are getting a rehaul, it seems. At the same time I wish to throw out anything that is in excess, like clothes and books that I don´t need. Very strong impulses to clean the body and dreams of doing laundry. Caffeine has to take a leave of absence for a while, something I had been trying to ignore. This may have to do with the heart chakra and palpitations that other Lightworkers are talking about. Perhaps we are becoming less tolerant to caffeine, just like alcohol. Currently I am off dairy and gluten, alcohol, and I don´t eat pork. Now it´s coffee as well as a lower intake of animal protein. I even go through days where I quasi fast: lemon water and fruits and vegetables. I do this instinctively and according to my body´s signals. What else? As usual, looking at emotional programming and baggage and karmic residue. Letting go of collective programming and transforming any negativity with visualizations, meditations and decrees. Purification is so important now in the last stretch that I am doing this every day. 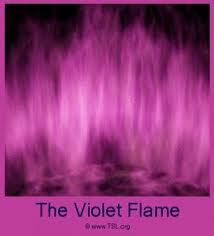 Using healing decrees or invocations to the Angelic Realms or Ascended Masters as well as using the Violet Flame are the tools I feel most comfortable with to help me prepare for the “OM WAVE”, as St. Germain calls it, due to appear between June 20-24th. Those will be days of massive upgrades and energetic downloads in the form of a giant wave of love. I know I repeat myself, but that´s because purification and transformation of 3D programming and karmic residue is the core of the LBP. The more you have cleared up your emotional, mental, physical and astral bodies, the more angelic you´ll become. We are transforming our carbon bodies into crystalline ones, which is an arduous and at times painful process. But for those of us near the end of this process, with very little clearing left to accomplish, we can use a very high portion of the light information from the OM WAVE in our own bodies to complete the carbon to crystal metamorphosis. If you want to read the channeled message by St. Germain about the OM Wave, click here. How about you? Where are you in your LBP? How is your clearing work going? What signals is your body giving you that your diet needs to change? What kinds of experiences is your Higher Self designing to help you let go of outmoded patterns? How are your relationships faring as your resolve karma? I´d love to hear about your processes. Why not leave a comment?